← NACCHO Aboriginal Health : Download @HealingOurWay report, titled #LookingWheretheLightIs: creating and restoring safety and healing, to coincide with PM Morrison’s apology to victims and survivors of institutional child sexual abuse. Ms Pat Turner AM, Co-Chair of END RHD and CEO of the National Aboriginal Community Controlled Health Organisation (NACCHO), says comprehensive and collaborative action to tackle the disease is needed to ensure Aboriginal and Torres Strait Islander children are given the chance to reach their full potential. 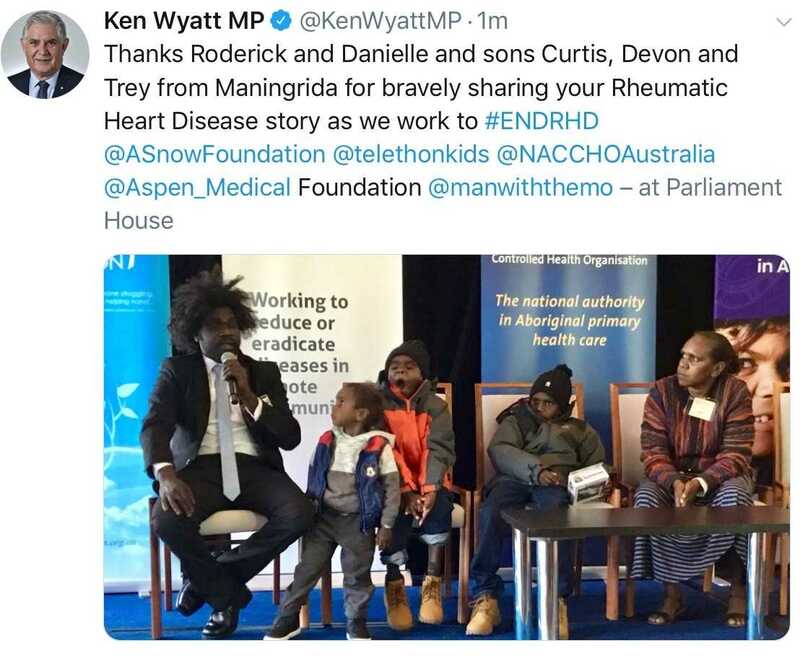 Three Aboriginal brothers – the youngest only three – who are living with deadly rheumatic heart disease (RHD) will today join community representatives, health workers and medical experts at Parliament House, asking for a commitment to end the disease in Australia. Virtually eliminated from the rest of Australia and most wealthy countries decades ago, rheumatic heart disease remains a scourge in developing countries and remote Aboriginal and Torres Strait Islander Communities, where rates are among the highest in the world. RHD starts with a sore throat or skin sores but can end with permanent heart damage, open-heart surgery and death at a very young age. Also speaking at the event is one of the world’s leading rheumatic heart disease researchers, Professor Jonathan Carapetis AM, Co-Chair of END RHD and Director of the Telethon Kids Institute, who says a nonpartisan commitment is the next step needed to tackle the disease in Australia. “Aboriginal and Torres Strait Islander organisations are taking the lead and working hand in hand with communities. We researchers are bringing the evidence to support them. If there is one country in the world that should be able to eliminate RHD, it is Australia,” Professor Carapetis said. The Snow Foundation CEO, Georgina Byron, said event participants are pleased that RHD has become a priority for the Australian Government. “The Government’s commitment to developing a roadmap to eliminate RHD is a great start, but we need an urgent allocation in the 2019 Federal Budget to commit to immediate action, fund comprehensive primary health care and appropriate educational activities in communities at high risk of RHD. We need to continue to ensure Aboriginal and Torres Strait Islander leadership, and set stretch targets to end RHD,” Ms Byron said. Aboriginal Communities are taking local action to stop the devastating effects of the disease through community-led solutions. A unique program highlighted today engages Aboriginal Health Practitioners to use traditional languages and new technology, to create a comprehensive local effort to identify and stop RHD. A comprehensive, community strategy, led by Aboriginal and Torres Strait Islander people, is critical to ending RHD. 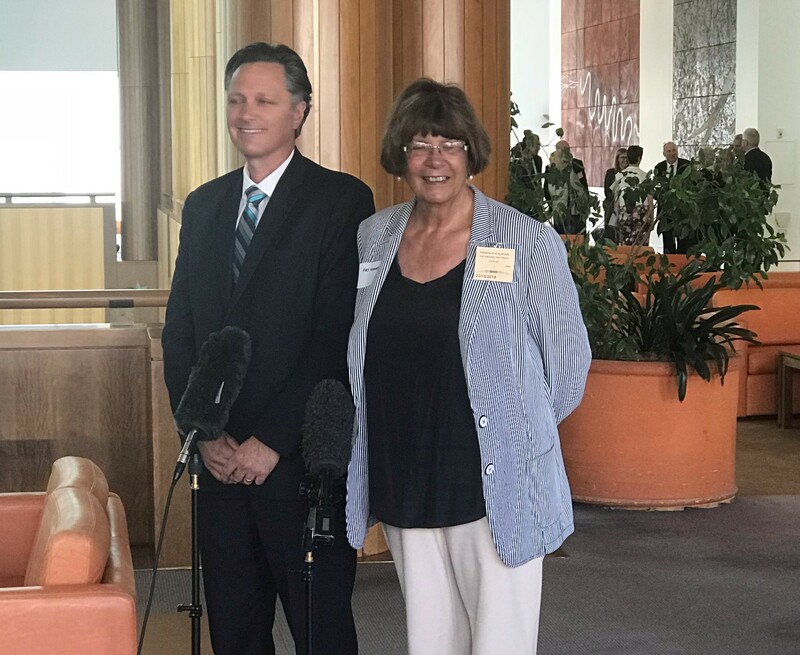 With strong leadership and political support, we will meet Australia’s commitment earlier this year at the World Health Assembly to prevent, control and eliminate rheumatic heart disease, but we need to take action now so that no child born in Australia from this day forward will develop rheumatic heart disease. The Snow Foundation is the creation of brothers Terry and George Snow who have a straightforward view—if you see someone struggling, give them a helping hand. Since it was established in 1991, the foundation has helped more than 250 groups, more than 240 individuals and provided more than $27 million in funds. Every dollar donated was given with the aim to enable individuals and organisations introduce positive improvement in their lives and their communities. The foundation has helped with projects big and small, in a broad range of areas such as education, belonging, social change and health. Projects include purchasing vital equipment for people with disabilities, developing microloans to help women escape domestic violence, funding scholarships, providing a home for the homeless, advocating for marriage equality, broadening the impact of excellent palliative care and partnering with community organisations, philanthropy, businesses and governments to improve and save lives whenever possible. 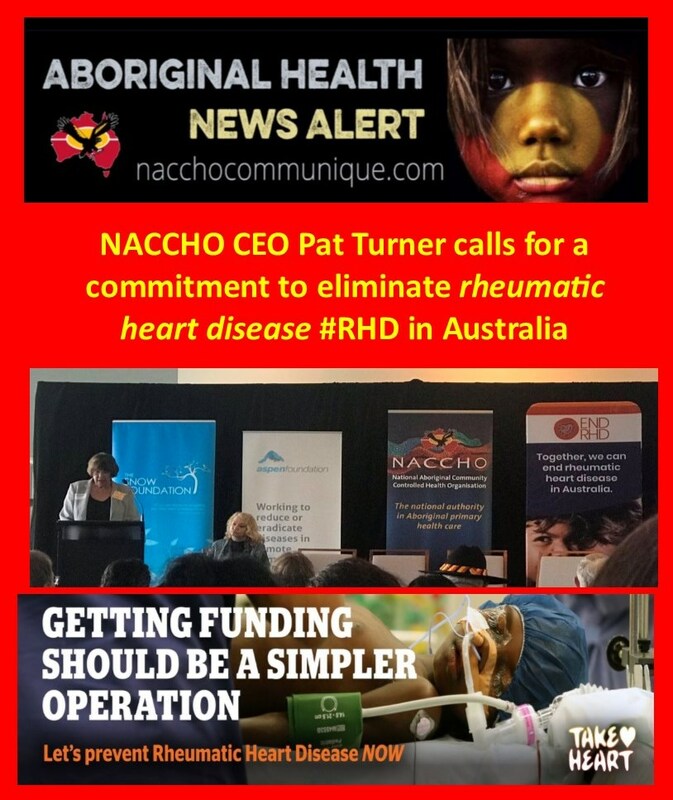 END RHD is an alliance of health, research and community organisations seeking to amplify efforts to end rheumatic heart disease in Australia through advocacy and engagement. The founding members of END RHD are the Australian Medical Association, Heart Foundation, National Aboriginal Community Controlled Health Organisation (NACCHO), RHD Australia based at Menzies School of Health Research, Aboriginal Medical Services Alliance Northern Territory (AMSANT), Aboriginal Health Council of Western Australia (AHCWA), the END RHD Centre of Research Excellence based at Telethon Kids Institute, The Aboriginal Health Council of South Australia (AHCSA), the Queensland Aboriginal and Islander Health Council (QAIHC) and the Aboriginal Health and Medical Research Council (AH&MRC). Thank you and I too wish to acknowledge the traditional owners. It is wonderful to join you on the country of Ngunnawal and Ngambri peoples. Thank you for your welcome, and to the traditional owners of this land. We are coming together today with Aboriginal and Torres Strait Islander people from around the country, including from remote Maningrida in the Northern Territory. I also want to welcome and acknowledge Minister Wyatt for his leadership on rheumatic heart disease. Let me begin by saying I believe that today can be the beginning of the end of rheumatic heart disease. Our shared vision is that no child born in Australia from this day forward should die of RHD. We are here – now – to ask for your help in bringing that vision to life. Rheumatic heart disease begins with a sore throat or a skin sore. For our children, these are common infections – but the impact can last a lifetime. A lifetime which, too often, is cut short. We are going to hear today about the impact of these infections and the complications they can cause when RHD develops. I will let families and health workers tell their stories about why that happens, and what it means for them. I want to tell you first why this matters for me. As the CEO of NACCHO, I spearhead the Aboriginal Community controlled Health Sector where we employ over 6000 staff people working across 300 clinics at the community level to deliver comprehensive primary health care. Comprehensive care means that we do everything – immunisations and iron infusions, injuries and ischaemic heart disease. Doing everything means that we rarely choose to focus on a single disease. There is so much to be done, we can’t afford to have ‘favourite’ diseases. But RHD sticks out. It’s the greatest cause of cardiovascular inequality for Aboriginal and Torres Strait Islander people in this country. Non-Indigenous people, literally, just don’t contract it. 98% of people who get RHD in Australia are Aboriginal and Torres Strait Islander people. We get it because of crowded houses, because – despite our best efforts – showers don’t work, taps don’t run, and clothes don’t get washed. We get it because our clinics are overwhelmed with demand and sometimes skin sores and sore throats go untreated. We get it because rheumatic fever gets missed and sometimes it is too late for treatment. At NACCHO, we became a founding partner of END RHD not because this disease is a simple fix, but because it is hard. Because it spans from housing to clinics to open heart surgery. It exemplifies the gaps in prevention in the health system and in outcomes. We are focusing on this because the only possible solution is a comprehensive, Indigenous-led primary care-based strategy of both prevention and treatment. In pursuing this goal we have an opportunity to work together, collaboratively, in new ways. We believe in that way of working and we believe that it can end RHD. We’ve been worried about RHD for decades. Young people kept dying and researchers kept writing papers about the problem. We’ve had some dribs and drabs of progress but it was always fragmented – some projects on echo screening, on improving needles for kids with RHD, some on better registers of people living with the disease. In 2015 the National Health and Medical Research Council funded the END RHD Centre of Research Excellence – the END RHD CRE. The END RHD CRE said they were going to write an Endgame Strategy for RHD. We thought they’d picked a weird name for yet another report on yet another disease. We carried on with comprehensive primary health care delivery. But the drum beat about the need to tackle RHD has grown louder, and today, we are at a tipping point. We heard about the work of Take Heart to tell the stories of people living with RHD. We saw that movie and we knew that sharing the reality of RHD was going to help everyone see what we already knew – RHD has an enormous impact in community. Then we started to hear about plans for the World Health Organisation to call for action on RHD globally – we know that Australia is one of the few wealthy countries where RHD still exists, and has a real opportunity to show international leadership in ending our domestic disparity. And, critically, NACCHO affiliates in the 5 jurisdictions with high rates of RHD – ACHWA, AMSANT, QAICH, AHSCA and AH&MRC. The interest of these groups made it clear that RHD isn’t something that we just have to live with or die from. It’s something we can take collective action about. In May this year we heard that a resolution on RHD was passed at the World Health Organisation in Geneva. All countries must report on their actions to address RHD. The world will be watching Australia particularly closely. Momentum since then has continued to grow. Minister Wyatt has shown great leadership in convening two roundtables on RHD, discussing the issue at COAG twice this year. Funding has been allocated to begin pilot programs in a small number of communities to prevent new cases of RHD. Other projects supported by philanthropic organisations, including our co-hosts, the Snow Foundation, demonstrate the power of community leadership. END RHD has been joined by a whole network of supporters who have signed up as charter signatories to END RHD (name or indicate logo – TBD). We are working closely with the END RHD CRE to make sure that their Endgame Strategy isn’t just another report on a shelf, but a really tangible roadmap of what we need to do to tackle this disease. And so we are here today – at the beginning of the end. And we need you to make it happen. Not just in a report – but in real world. For a commitment to eliminate RHD in Australia. For a clear plan of action and targets to measure progress. For a commitment to achieve those targets through the COAG process. To appoint an Indigenous-led Steering committee to oversee that work. We estimate that it will take two decades to end RHD. It’s going to take money. Some now, and more later. Probably much more – my research friends are running up the numbers to estimate the cost. It’s going to mean working beyond the health sector. We need action on housing and environmental health, which drives this disease. So there is a long road ahead of us – but that road is transformative. Not just because we can save lives and prevent the human suffering of RHD. That is important. But also, because a comprehensive, community-led approach to primary care and environmental health will help address so much more: ear disease, eye disease, childhood lung infections. RHD is just the start of this new way of working. END RHD and our partners stand ready to put that new way into practice. We are already working with individuals, families, and communities most impacted by the disease. We are working with researchers to develop the best, and most effective recommendations. We are working with allies outside of health, in business, and in philanthropy to combine our efforts on this disease and all the preventable suffering it represents. Today we come as a community, to Canberra, to seek a political commitment to support these efforts. Make no mistake – the financial ask is brewing and we expect that to be accounted for – but today, we ask that you hear the RHD story from the people who live it – and ask that you join us to commit, publicly, to end rheumatic heart disease in Australia. To resource that. And to let us lead the way.